A Day After Massive Landslide In China, 85 People Still Missing : The Two-Way The landslide of mud and construction materials is the latest in a string of disasters in China that were caused by human error. 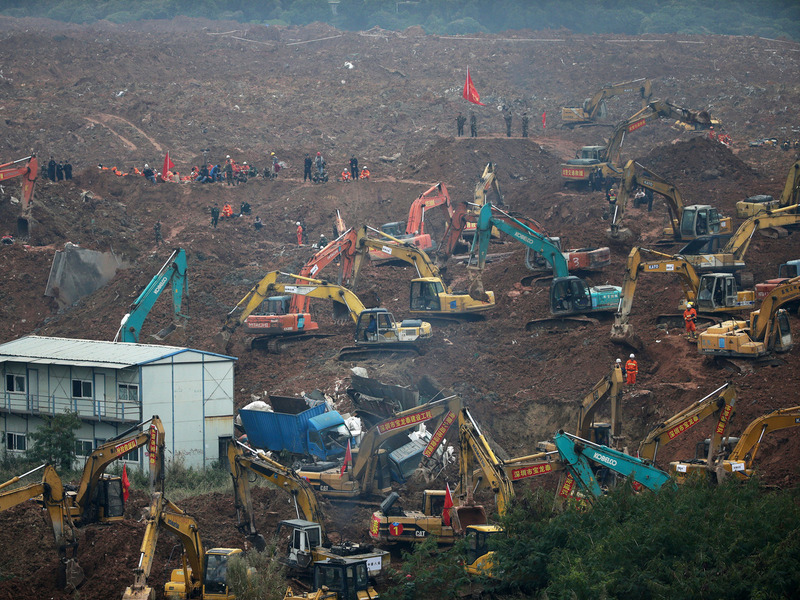 Rescuers use machinery to search for potential survivors following a landslide in the south of China. Rescue crews are working to locate more than 85 missing people after a massive landslide swept through the southern Chinese city of Shenzhen. "When it all came down, the mud covered an area of some 650,000 square feet. In some places, the mud was up to 20 feet deep. "In addition to fire fighters and police, authorities deployed bulldozers, drones and sniffer dogs to search for survivors. Other personnel are repairing a natural gas pipeline which blew up after being hit by the landslide." "In Sunday's landslide, the Ministry of Land and Resources said a steep man-made mountain of dirt, cement chunks and other construction waste had been piled up against a 100-meter (330-foot) -high hill over the past two years. "Heavy rains in the region saturated the soil, making it heavy and unstable, and ultimately causing it to collapse with massive force." It was the fourth preventable accident in the past year, following a New Year's Eve stampede in Shanghai that killed dozens; the capsizing of a cruise ship on the Yangtze River that left nearly 400 dead; and an explosion in the port city of Tianjin that killed more than 50. China's official Xinhua News Agency reported that 16 people were hospitalized, including a child, and that only seven people have been rescued. No deaths have been reported.